Leonie is a 3-5 year old female Cross-Breed. Leonie was rescued in Cyprus and has flown to the UK to help her search for her forever home. She is currently living in her foster home in Cambeltown. Here is a little about her: Leonie is a friendly young girl who bonds well with her human family. 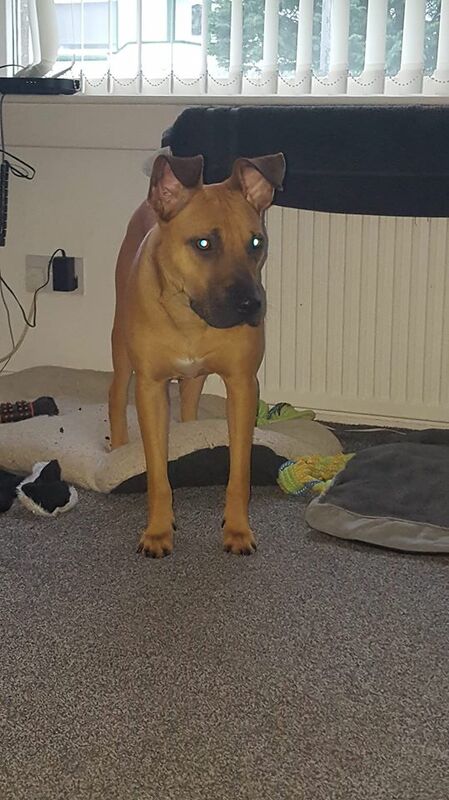 Whilst we do not know her exact parentage, she looks to have some Staffordshire Terrier, together possibly with a bit of Malinois, given her distinctive, expressive ears. She really is a stunning girl. She is looking for an active home preferably with older children as she still young and has the boisterousness that young dogs have. 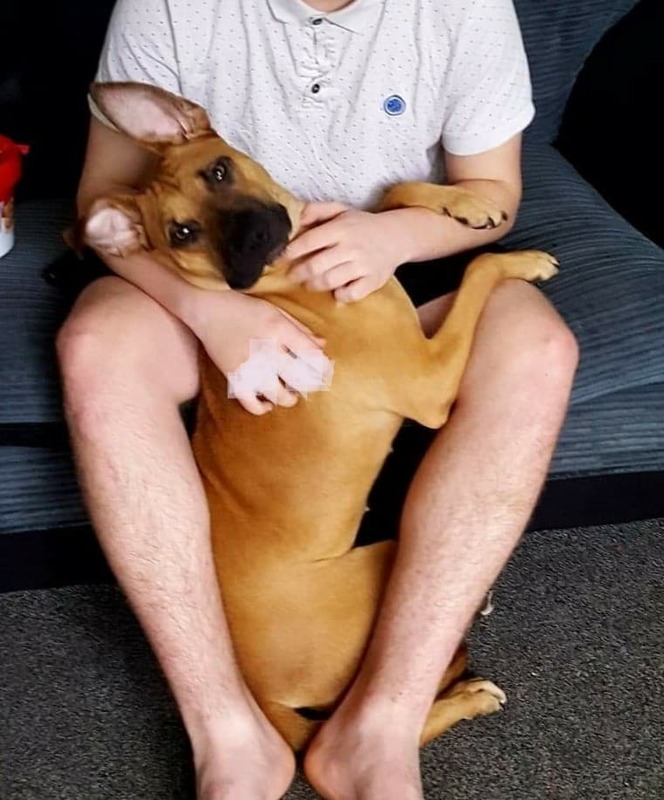 She would prefer to be the only pet as whilst she’s okay with other dogs socially, she can try to be dominant and does stand her ground so better as an only dog in the home and definitely no cats or small furries. Preferably her new human should be experienced with dogs and be someone prepared to continue her training. She’s quick to learn and very intelligent and lots of fun to be with. A larger garden securely fenced above 6 ft is a must as she likes to go explore if left to her own devices and can jump lower heights. 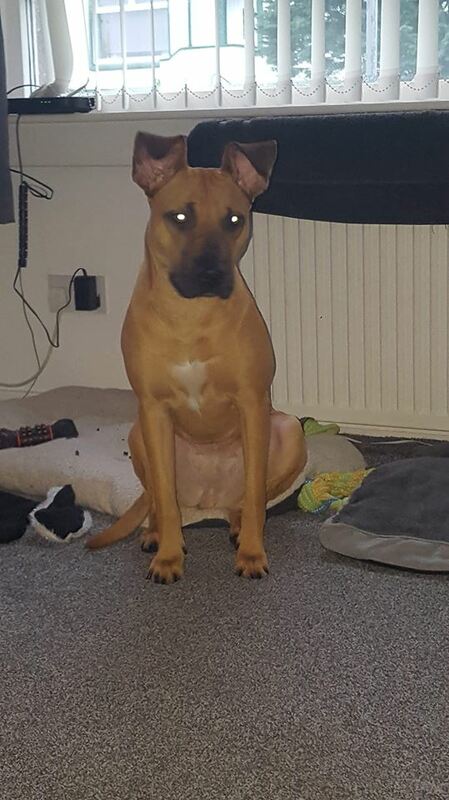 She’d be ideal for a family with children over the age of 10 and would love if her new family have friends with dogs to walk with or take her walks to meet doggie friends. She needs someone home a lot initially as she has displayed a little separation anxiety and would prefer not being left for long periods of time. She’s a sociable girl who’d be okay in a busy home environment, but will benefit from stimulation in the form of play and brain games. Agility or Cani Cross activities may also be enjoyable with her when her training reaches that level. She is house trained and sleeps well through the night. When out walking she does walk better on a halti. She has been neutered, vaccinated and microchipped. The minimum adoption donation for Leonie is £275. ADOPTION IS SUBJECT TO HOME CHECK. Full post adoption support is offered by our charity.